When the humans head out to go camping, the animals settle in for a relaxing holiday of their own! Teen bear takes over the bathroom with her curling iron, the beavers prepare their fanciest recipes, and the deer kick up their feet for a dance party. 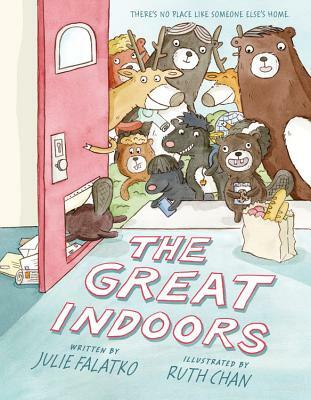 What starts as a little unwinding soon escalates to a big mess, just in time for everyone to head home. . . .
Julie Falatko and Ruth Chan's quirky humors shine in this hilarious take on family trips that will have kids wondering what exactly goes on back at home when they're on vacation. Julie Falatko is the author of the Snappsy the Alligator series, illustrated by Tim Miller, as well as the Two Dogs in a Trench Coat series, illustrated by Colin Jack, and No Boring Stories, illustrated by Charles Santoso. She lives in Maine with her husband, four children, and two dogs, where she maintains a Little Free Library in front of her house. Visit her online at juliefalatko.com. Ruth Chan spent much of her Canadian childhood tobogganing, another chunk of time studying art and education at Wellesley College and the Harvard Graduate School of Education, and a decade working with kids in underserved communities in Boston, DC, and NYC. She has since become a full-time illustrator, spending her time creating picturebooks, illustrating for various clients, and doodling on the train. Ruth now lives in Brooklyn, NY with her dog, Feta. Find out more about Ruth and her other books at ohtruth.com.